Hello there and thank you for popping by. My name is Emma and I am a first time, real life mum. I am married to Michael or Mikey as he has renamed himself, (I’ve never called him that [Mid-life crisis]) and together we have our beautiful daughter, Robyn who was born in December 2017. Ralph our furbaby Pomeranian completes our little family and is seen frequenting all our social medias with his down right cuteness. Robyn although she can say Mummy opts to call me Mimi hence the name Robyn and Mimi. Adjusting to motherhood is no easy feat. I am pretty sure if you open up the browser on my phone and search the history 95% will be some search term relating to a parenting dilemma (which are a daily occurrence). Since having Robyn I have just enjoyed sharing her with the world and documenting her growing up, particularly through Instagram and felt like I wanted to start writing a bit more down. 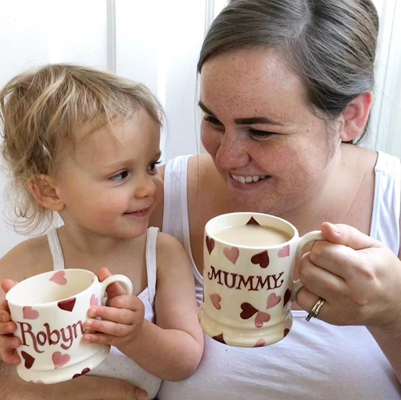 I really enjoy looking to others for inspiration and reading up on others experiences of motherhood as well as interacting and getting advice, hints and tips on certain things whether that be products, days out, travel – literally everything! Here I want to document my own experiences of motherhood as well as talk about the things I liked before having Robyn and still continue to like now that I’ve had her. Hoping to create a happy, inclusive and interesting little space, where everyone is welcome. Or maybe you’re just stuck under a napping baby and you’ve read everything else on the internet. Mimi to Robyn & fur baby Ralph. Wife. Tired. Stressed. Blissfully happy. Sometimes. Likes weak tea, no-one is perfect.